Xconomy: Danish Robots Storm New York, Establish Beachhead in U.S.
Danish Robots Storm New York, Establish Beachhead in U.S.
A Denmark-based maker of lightweight industrial robots announced Thursday it has set up its U.S. headquarters near Stony Brook, Long Island. The office and warehouse space will serve as a distribution, sales, and tech support center for Universal Robots. The company also plans to offer training seminars and demos at the facility. 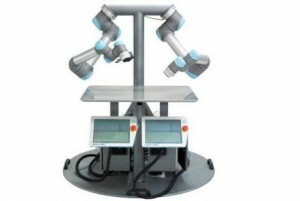 Universal Robots established a subsidiary in New York in 2012 but without a local brick-and-mortar headquarters. While its engineering and research will remain in Odense, Denmark, the company says it will assemble its robots here. The robots can be controlled via monitors and tablets, as well as be programmed to directly assist employees in a production line. The finishing touches on the robots—the addition of tools and grippers to perform tasks—will typically be handled by distributors, the company says. Universal Robots makes robots that are used in machine shops and at industrial and production sites. Founded in 2005, Universal Robots is funded by Syddansk Teknologisk Innovation and the Danish State Investment Fund. The company’s robots can be found in more than 40 countries, being used for engineering, packing, analysis, and other purposes.